Want to get tastefully drunk in a coral reef? Head out to Per Aquum's Niyama resort in the Maldives. They once boasted the first underwater nightclub, Subsix. Now, Subsix has been transformed by Poole Associates into a restaurant and party space. That means that your Little Mermaid wedding fantasy can finally come true. Subsix is literally in the middle of nowhere. The Niyama resort is forty minutes by seaplane to the Maldivian capitol of Malé, and Subsix's entrance is another 500-meter speedboat journey from there. Descend three staircases and you finally arrive and it's the best thing that's every happened to your Instagram. The glass walls allow you to look out on over 90 species of coral reef and all the aquatic life swimming among it—Eels, butterfly fish, turtles, and more. 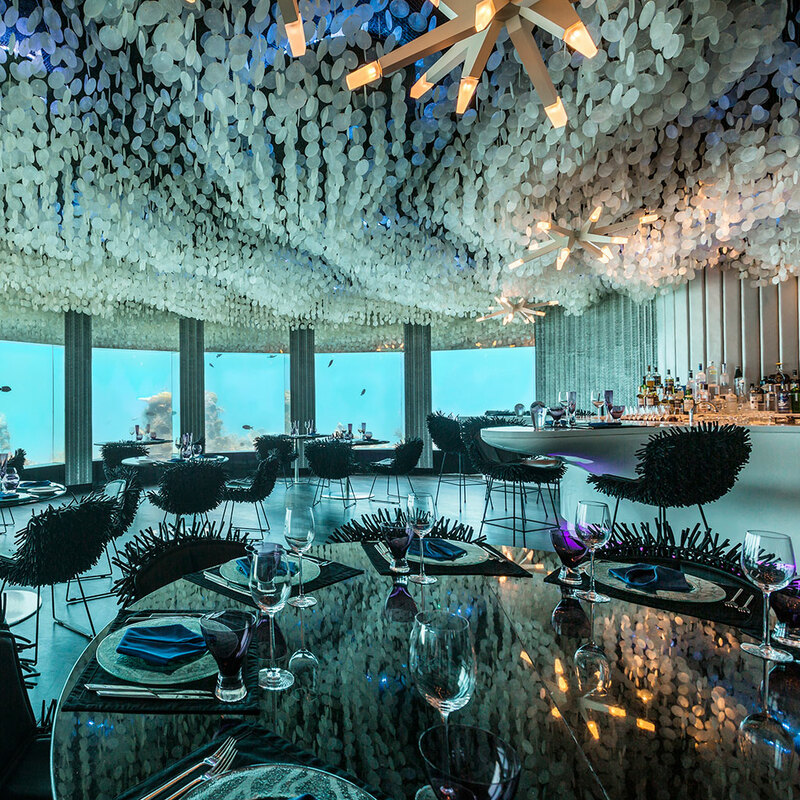 The space itself mimics the reef, with ceiling furnishings that resemble glimmering scales, chairs and light fixtures that recall the shape of coral, and curved architecture that keeps the space feeling organic. As the resort's general manager Dietmar Koegerl says, "Subsix is the closest you can get to the reef without a mask or a wetsuit. Guests fell so in love with the setting from the start that we knew we had hit on something special and had to take it to the next level." As a nightclub, it enjoyed wild popularity but served a limited audience. Of course, since lunches at Subsix cost about $165 per person, one might argue that it still only serves a limited audience. In the meantime, we'll stick to snorkeling and ogling Subsix on Instagram.